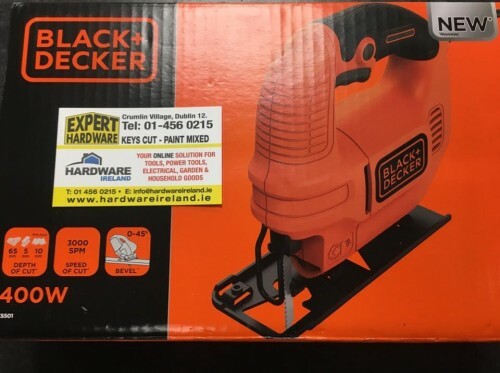 The Black & Decker KS501 Compact Jigsaw has an ergonomic, low vibration design for comfort. The integrated dust blower keeps the line of cut clear and free from debris. Fitted with a lock-on switch for increased comfort during prolonged cutting and positive bevel detents at 0 and 45°. 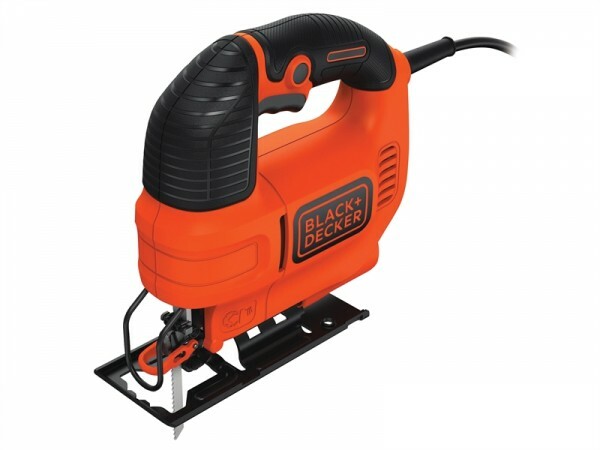 Suitable for general wood cutting, curved cuts and basic 45° bevelled cuts. Also for light sheet metal, metal pipe cutting, light decorative, hobby and DIY tasks. It is supplied with 1 x Wood Cutting Blade. Specification Input Power: 400 Watt. Strokes at No Load: 3,000/min. Stroke Length: 19mm. Bevel Cut: 0-45°. Capacity: Aluminium: 10mm, Steel: 5mm, Wood 65mm.